We asked Gary, Sheila and Harry to talk a bit about their experiences of Conservative Party Conference. Here’s what they said! It was good that people with Learning Disabilities and parent representatives where there. There were also two academic students who attended the conference with us. I’ve been to these party political conferences before. We had good meetings with Dominic Grieve QC and Liberty – they knew all the legal stuff, especially on things like Human and Civil rights. The down side was that when we went to fringe meetings it was hard to get a word in edge ways. There was a lot of questions I wanted answers to, there never seemed to be enough time though, and sometimes the panel did not really take on my questions. It would have been great to have more people with learning disabilities and families at these party political conferences – it would be great to be there big in numbers. I have already been to 1 Labour and 2 Conservative conferences in two years. In the future I would love to go to the other minority party conferences as this will give me an idea what they are saying about people with Learning Disabilities. I am a family member of LDE and part of LDE’s steering group. This was my first ever party conference – I went to the Tory party conference. The overriding impression was the sheer scale of the event: the numbers of people, the numbers of fringe events over and above the main political speeches. Annie at LDE had very kindly pointed out a few meetings that would be relevant for us to attend, and set up meetings with specific people; otherwise we would have faced a mammoth task sifting through the options. It made me realise just how difficult it must be to make your way in politics, and navigate the system. And the energy and stamina that you need. The meeting we had with Liberty was perhaps the stand out moment. It provided an important starting point for new opportunities to work together, and potentially raise important issues such as the care, or lack of it, of people with learning difficulties in the NHS, as illustrated by the recent events at Southern Health. I certainly think that it is important for LDE to be represented and would encourage family members and self-advocates to go to the party conferences; but those unused to networking and talking to strangers perhaps need more help and preparation. We also often found ourselves in fringe meetings talking with people who already knew and understood many of the issues facing people with Learning Difficulties; getting the message across to a wider audience is more difficult. Simply asking a single question in a meeting is not enough; it felt much more effective when we were able to talk one on one with people at the end of sessions. 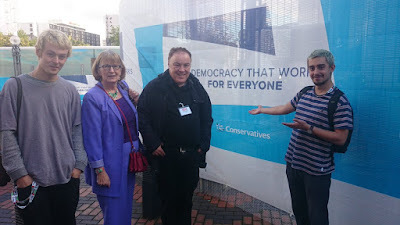 Earlier this month I was lucky enough to attend the Tory Conference with LDE. It was a fascinating insight into a political culture I’ve had very little experience with and despite drawing some worrying conclusions from the experience, I highly recommend any other students to take part. The first thing that struck me is the divisions in the party on the subjects of disability and social care. There was a distinct feeling amongst representatives of local government that the cuts to services and current set of welfare assessments were failing families and people with disabilities. Even going as far as to refer to the cabinet, and other Westminster conservatives, as if they were from a different party entirely. I found this a particularly interesting representation of the under reported tensions in the party, while also presenting a far less black and white ideological image than I had imagined previously. Having said that, this does seem to raise a bit of a paradox in that while the cuts are not supported, seemingly neither is real investment in services. Furthermore there seemed often to be a hushed reference to privatisation as a way of solving this, something that has a track record of continually not solving these problems. But there are some real champions surrounding disability, our meetings Dominic Grieve and Ian Birrell showed this. But there still seems to be a lack of interest on a cross party basis, stopping real change from manifesting. MP’s rarely turned up to the panels we attended, notably Jeremy Hunt not turning up to any. This gave the proceedings outside of our personal meetings, a kind of hollowness that fundamentally gave the impression that whatever panel members feelings on the issues, the real decisions would be made elsewhere. This was a stark difference from the kind of engagement we found at the Labour conference from both MPs and Shadow Cabinet. Another key difference I found was the serious lack of self-advocates, people with disabilities and families at the conference. People who should be an integral part of formulating policy and discussing issues. This lack of dialogue is something I found very worrying considering how much work is needed on the current policy presented by the party. What is worth mentioning as well, is a great meeting we had with Liberty who seemed keen to engage with a number of issues concerning the treatment of people with learning disabilities. I thoroughly recommend any students to get involve in future as it was great opportunity, an exciting inside look on politics at it’s most extravagant. Although I think Ben mentioned this, it is worth reiterating how helpful having a focus and purpose is in such a huge event. Subsequently this also educated me on the importance of the work LDE does and I hope to get involved again. Thanks to Annie, Alicia, Sheila, Sui-Ling, Martin, Paula, Gary and everyone at LDE. Had a great time! We’ve also written about our thoughts on Labour conference, which you can read here.